I hope you had a lovely 4th of july!I am happy to see you are posting again! Lots of love!! Nom Nom Nom~ What a beautiful dessert and teacup! I was grateful it was not too hot here. I hope you have not had bad heat as well? I need rain, my grass is straw. Happy Belated 4th of July! I do admire your teacup. I saw a red one just like it a few years ago in an antique shop and they were asking seventy dollars for it. I wasn't going to pay that no matter how much I loved it. Your teacup in the blue is beautiful too. So glad you could join us this week. Looks like you had a delicious treat! What a pretty Patriotic post I adore your tea cup and that desert looks so yummy!! Thanks so much for stopping by and for taking the time to comment! And thanks for following meon my new Blog!! I so appreciate it!! Such a delicate cup and saucer. I love the design Terri! That bird is amazing! And oh that Patriotic dessert looks truly amazing - never seen or heard of this. I hope your celebration with your loved ones was really special. 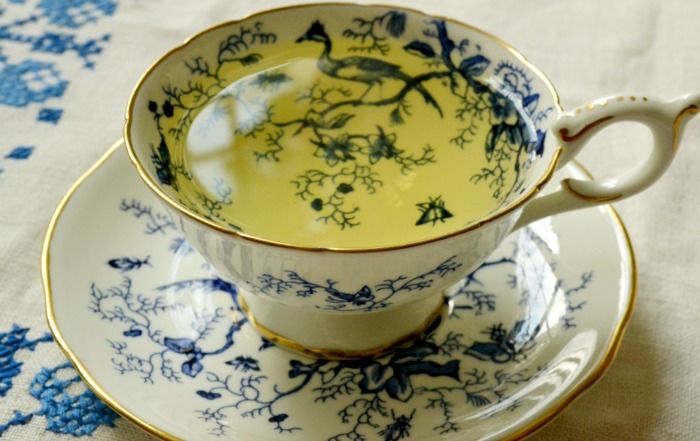 Hi Terri, that is a very beautiful tea cup that you are showing in your post. Never seen the pattern. Would you tell who the maker is? Your trifle looks so yummy and it reminded me of the last one that I had, which was on our England vacation. It was so good. Maybe I should try to do a trifle myself next weekend. Have never made one, but I am sure my husband wouldn't mind ;-)! Your beautiful teacup and patriotic trifle dessert was the perfect way to celebrate Independence Day! Hi Terri! 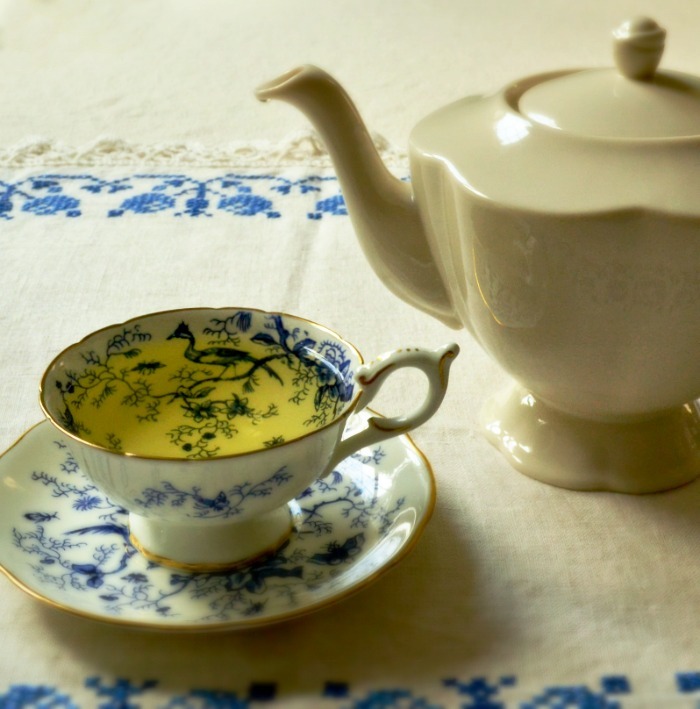 Your teacup is so lovely, and I especially love the pretty cloth that you have set everything on. My, would I ever like a serving of your patriotic trifle. I'll bet your family was thrilled with your dessert. I know you had a Happy 4th! Hi Terri, I was thinking of you today and it was nice to see your post. The dessert is too yummy and looks just great. Yum! I'd like to have a bite of that tasty dessert tonight. Thanks for the visit and thoughtful comment. TErri I hope you had a lovely 4th! I love that teacup! 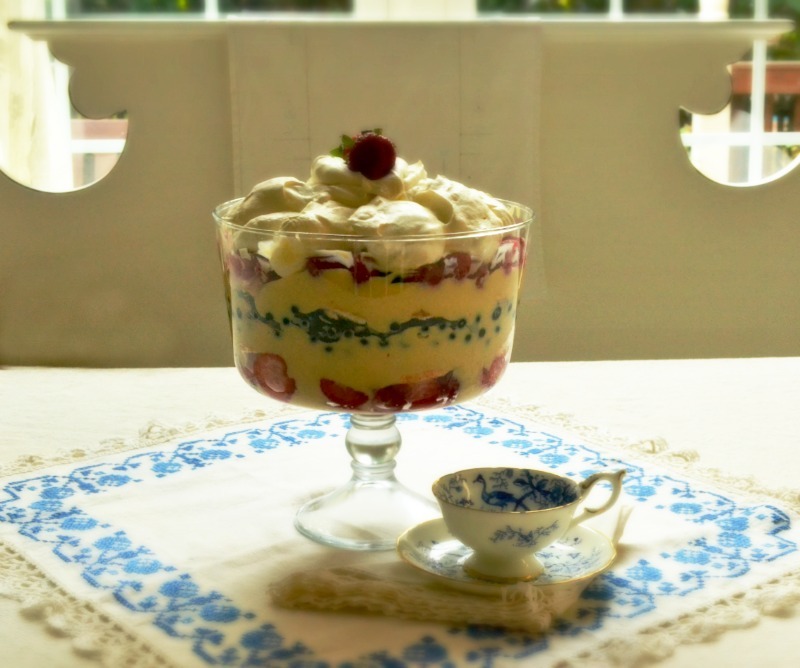 Such beautiful photos and oh my that trifle looks so delicious! Terri- you have shared an absolutly perfect tea time for Independence Day! How beautiful! Hope you are keeping cool - sure has been HOT! Post before last shared some awesome good news! Oh my dear Terri , this is like a magic tea party, with your beautiful little cup, and the masterly done trifle , the sweet blue pattern on cup and saucer ,so delicate and I also love your cream colored teapot. I`m happy you had a wonderful day in the family, my friend.